By the end of 1955 rock’n’roll was starting to creep on to British radio. School was, for Alan Blakley and me, Park Modern School in Barking, Essex. Alan Blakley and Alan Howard had arrived at our school from another Barking school to sit their O levels. Rugby was the school game, and we had two lessons per week of it. When I used to ask Alan Blakley how we first met, he would always explain “it wasn’t much of a meeting really, just my nose on the end of your elbow and then nothing for a few seconds”. Alan and I were to become the best of friends and were very close until he sadly died in 1995, leaving me with the memories of our dreams and aspirations from our teens to our 50’s and 60’s. Portable radios were ‘all the rage’ and you could listen to Lonnie Donegan, Bill Hayley, early Buddy Holly and many others on stations like Radio Luxembourg. One night after watching ‘Sputnik’ go across the sky for the first time Alan and I went by bus to a place called the ‘Cellar Jazz Club’ in Ilford Essex. Being underage, we were not allowed into the club, but once the show had started we would ‘bunk in’ and hide under the stairs where we would watch the Monty Sunshine Band, the Chris Barber Band and many other traditional jazz bands. On one occasion we watched as, during the band’s break, Lonnie Donegan the banjo player, and a couple of musicians played the music known as skiffle. Of course we went straight home and decided to acquire guitars by hook or by crook. Maybe we could play this great music we were hearing both live and on Luxembourg with just guitars and a tea chest bass. Alan Blakley decided we should try and make guitars in our school woodwork class but this was spectacularly unsuccessful and gave us many a laugh over the years. Feeling sorry for us, our dads decided to buy us our first guitars. We had little idea of chords so if we couldn’t get the noise we wanted we would retune or remove the strings to suit our needs. I still occasionally play guitar that way (don’t ask me for a demo it’s not a pretty sight or sound!). Many other bands were starting in our area, such as The Symbols and Tony Rivers and the Castaways. 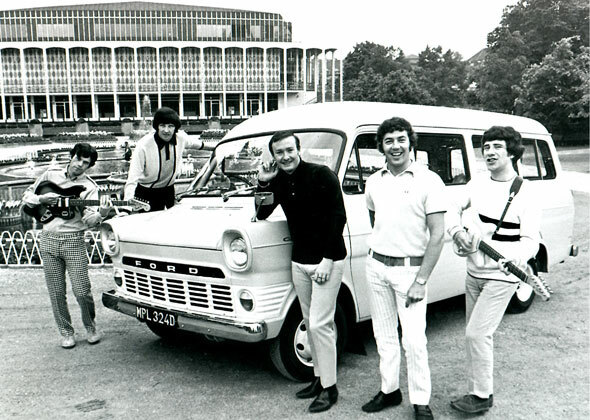 Many more followed because these were the years of Thames vans, Bedford dormobiles, crew cuts, Jim Marshall’s first amp (which we were instrumental in developing), dance halls, coffee bars, motor bikes, Vespas, Lambrettas, the hit parade, Vox and Hoffner guitars, tape recorders, rock’n’roll radio shows, DJ’s, Brian Matthew, Jack Jackson, American camps (which were to become our main work later), trad jazz, our letters to Buddy Holly and Norman Petty, hippies, beatniks, ‘O’ levels, ‘A’ levels, homework, leather, Ford cars and with Dagenham being the Mo tor town of the south, hence “Dagenham Motown”. Later we had the first Thames 12 seater No.1 out of Dagenham as documented in the Daily Mirror.